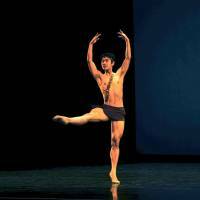 JACKSON, MISSISSIPPI - A Japanese dancer won the silver medal Friday in the junior male division of an international ballet competition held in Jackson, Mississippi. The winner, 17-year-old Hyuma Kiyosawa, who lives in San Francisco, was happy with his achievement at the USA International Ballet Competition. No gold medal was awarded. “While I am frustrated at failing to have won the top prize, I am happy with the good result at the contest,” Kiyosawa, who hails from Matsumoto, Nagano Prefecture, said. It was his first time dancing to live orchestra music. “It just felt wonderful. It was such a great experience,” Kiyosawa said. Kiyosawa’s father, Hidehiko, said he was surprised by his son’s performance. Chisako Oga, a 21-year-old dancer born in Dallas who represented the United States in the senior women’s category, won the bronze medal. Oga, who lives in Cincinnati, said she was surprised as she did not expect to win any medal. The two-week-long event began on June 10. Eighteen dancers from eight nations were given awards or medals, organizers said. Held once every four years, it is known as one of the three most prestigious ballet competitions in the world. At the Jackson contest, dancers aged 14 to 18 compete as juniors and those 19 to 28 as seniors in three stages.